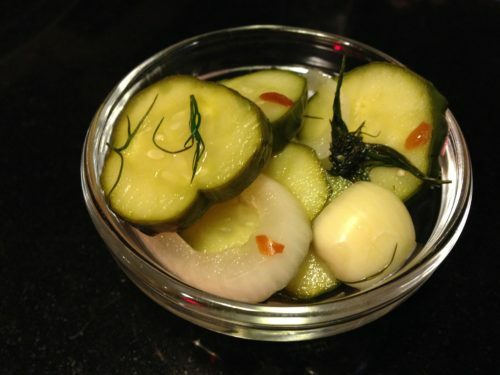 Easy Spicy Dill Refrigerator Pickles. It’s that time of year when cucumbers are super prolific and tend to dominate the garden’s produce bounty. My farm neighbors have a large garden plot. I’m grateful that they share their produce with me. 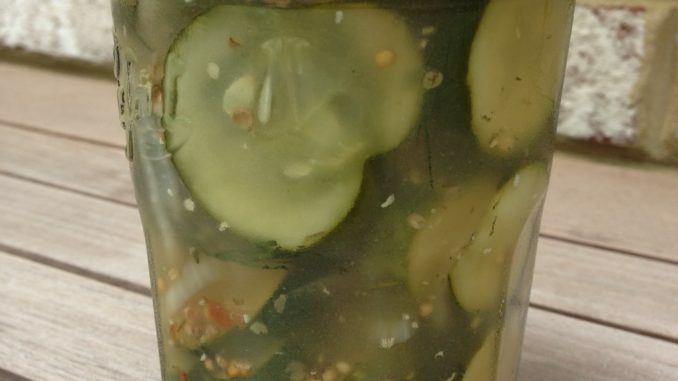 Pickling cucumbers have started to mature so it is time for me to post my favorite Easy Spicy Dill Refrigerator Pickles recipe. Pickling cucumbers are a bit different from the salad cucumbers that we normally eat. 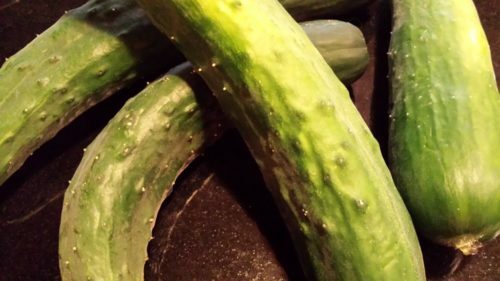 Pickling cucumbers have thicker and prickly skins and tend to be a bit denser and smaller. They definitely hold up better in a salty pickle brine than do regular cucumbers. 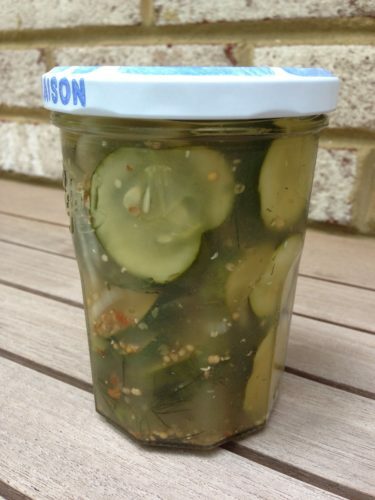 My pickles will never rival my favorite McClure’s spicy dill pickles yet they are a quick and less spicy substitute. 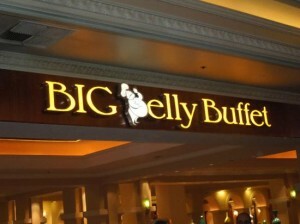 And they are homemade so I know exactly what goes into them. I make my pickles with homemade apple cider vinegar, homemade dill vinegar, fresh dill sprigs, spices, sweet onion and garlic. My apple cider vinegar was an accident when some apple cider went “bubbly” last fall and I decided to make vinegar out of it. You can use the store bought version. Also, you’ll want to have some fresh dill on hand for this recipe. You can use dried dill but the fresh dill is so much more flavorful. 1. 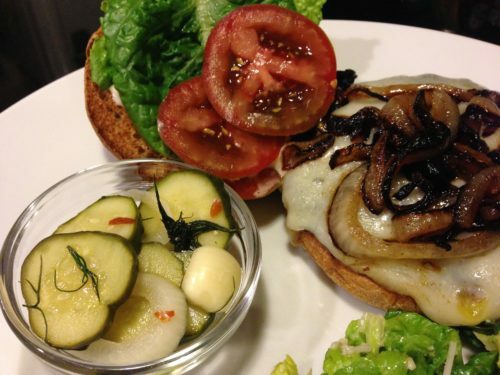 In a large 2 quart glass jar, layer the cucumber and onion slices. Add the garlic pieces and then the dill. Set aside. 2. In a Ziploc bag, crush the mustard seeds and peppercorns with a mallet. You could also use a mortar and pestle. 3. Pour the crushed spices into a 2 quart saucepan. 4. Add the vinegars, water, sugar, salt, and pepper flakes to the pan and stir. 5. Over medium high heat, bring the liquid to a boil until the sugar dissolves, stirring often. 6. 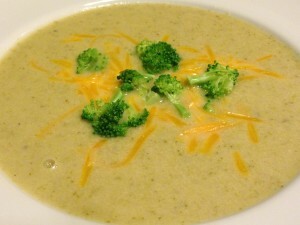 Remove the boiling liquid from the heat and set aside for 5 minutes. 7. Pour the slightly cooled liquid over the glass jar contents being sure to get all the spices from the pan into the jar. 8. Add more water to ensure the cucumber slices and other contents are covered completely. 9. Put the uncovered jar into the refrigerator for 24 hours. 10. Stir or shake the contents a few times over the 24 hours. 11. After 24 hours, tightly screw the lid onto the glass jar. 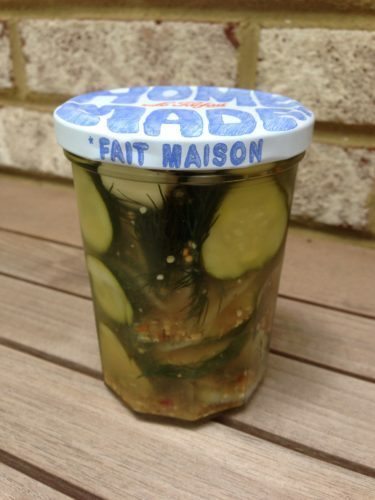 You can divide the pickles and their brine and seasonings into smaller glass jars with lids if you wish. Keep refrigerated. 12. The pickles should be ready to serve within another 24 hours of refrigeration. Makes about 2 quarts of pickles. Serve as a condiment with The Best Burger or my favorite Egg Salad Sandwich. Keep the pickles refrigerated and be sure to consume them within 2 weeks. Variations: If you like less spice, omit or cut back on the red pepper flakes. You can use white vinegar instead of the apple cider vinegar but I think the white vinegar is harsher. Cut back on the garlic or add more according to your tastes. You could substitute honey for the agave syrup.